My heart races and my mind goes in a thousand directions at once when I step outside and see what seems like every plant blooming at once. Daffodils, hyacinths, crocuses, snowdrops, star flower, glory of the snow, pansies, violas, forsythia, star magnolia, red maples, and purple deadnettle are all in full bloom. Leaves are coming out for this spring madness of warm weather, too. Leaves that should know better, leaves that could be zapped by a frost or freeze. It's enough to cause a gardener to run madly around her garden trying to figure out what to do first and next, all at the same time. So yesterday, I took a deep breath and decided that I would stay on course, stick with the time table of my choosing and plant some peas because that's what I do on St. Patrick's Day. I plant peas. 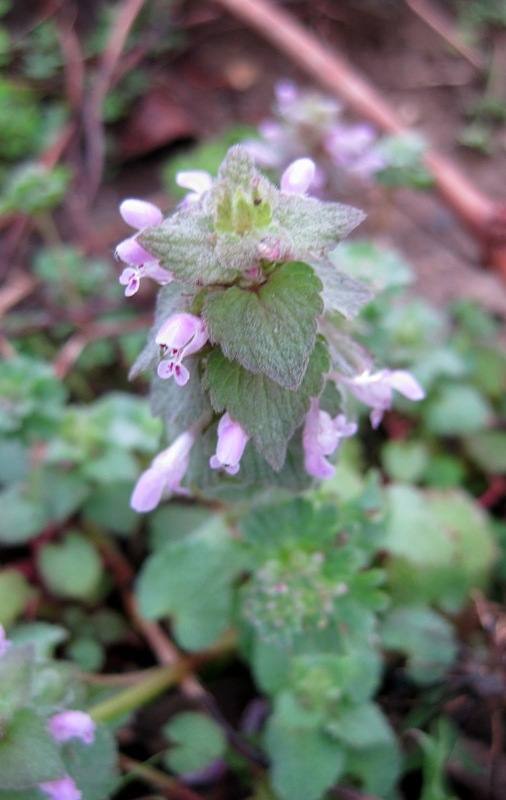 I gathered up some tools -- a rake, a hoe, the wheelbarrow -- and headed out to the vegetable garden only to find that it was a bit over run with a weed that I've decided is purple dead nettle, Lamium purpureum. The other choice was also a deadnettle, sometimes called henbit, Lamium amplexicaule. It doesn't really matter which weed it is, the cure is the same. Pull it out. I looked upon my vegetable garden with its bumper crop of this "late winter annual" and took a deep breath. "A bit overrun" is a tiny understatement. It is a lot overrun. As overrun with deadnettle as it has ever been. I thought to myself... just one square foot at a time... just one square foot at a time and soon enough, you'll have this under control, Carol. Ha! Though it is a winter annual, deadnettle doesn't respond to the hoe as one might expect, with its mats of roots clinging to the dirt for dear life. It is almost hoe-proof. After a few attempts at knocking the deadnettle back with a hoe followed by a few minutes of sheer panic, I said to myself, "Oh my blooming radishes, how will I ever have the time and strength to remove all this purple deadnettle, this Lamium purpureum, and set up new raised beds in time to plant anything in May, let alone peas today." I decided then and there to get some help, and so help is on its way. In the meantime, along the fence, I had created a flower border of sorts and edged it with some leftover retaining wall stone to separate it from the rest of the vegetable garden. Fortunately, I was able to use my hand-digging hoe to clear the deadnettle out of this area, one square foot at a time, so that's where I planted the peas. 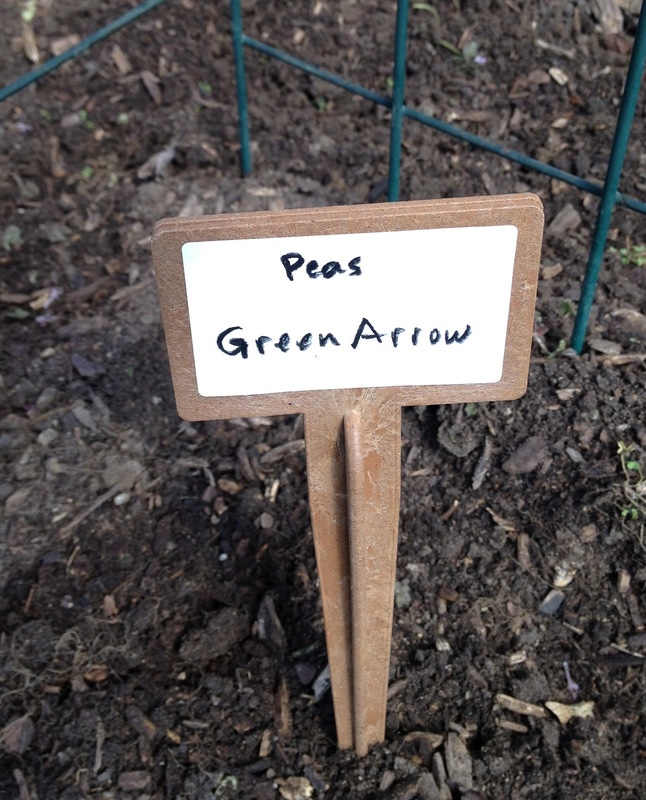 I planted 'Green Arrow' peas for shelling and 'Mammoth Melting Sugar' snow peas for pods. Long-time readers could have guessed I planted 'Green Arrow'. It's my sentimental favorite. I marked the rows of peas with some new bio-degradable plant labels from Cobrahead. You should always put a label where you sow seeds, just so you'll know what it is when it comes up there. Otherwise, you'll look at the little seedlings and wonder what they are. 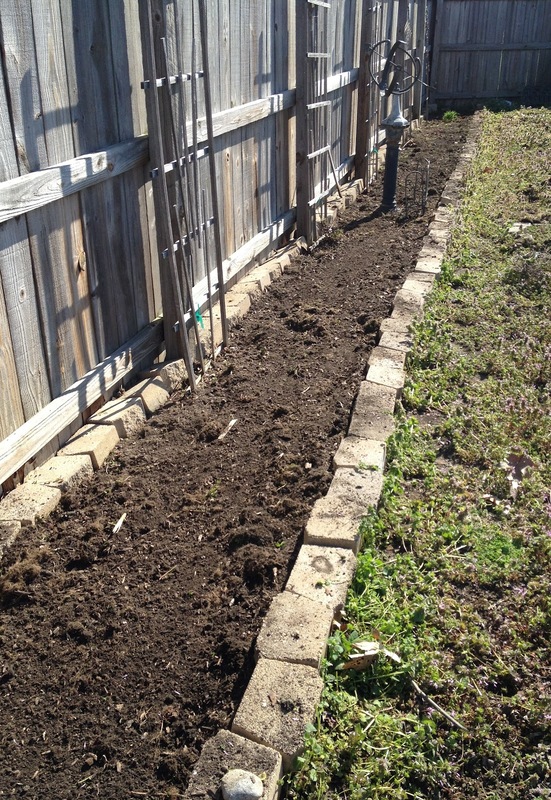 Today, I'll sow seeds for lettuce, spinach, radishes, and Swiss chard in this cleared area, and maybe buy some onion sets to set out, too. As for the purple deadnettle? I'm ignoring it for now. Help is on its way. The deadnettle is daunting me as well. Also the hairy bittercress. I guess if they didn't do so well, we wouldn't call them weeds. Good luck! I hope you are right about your planting. I'm in two minds about it with snow on the ground and the plans in hand. I went to plant my peas yesterday, but the dogs had had a midnight snack a month or so ago and I never noticed that they were missing. So, after a trip to the store today, I'll be planting my first crop. then I'll keep my fingers crossed. 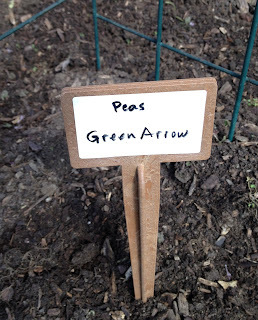 I've never tried (no seen) "Green Arrow" peas. I'll have to look for some. 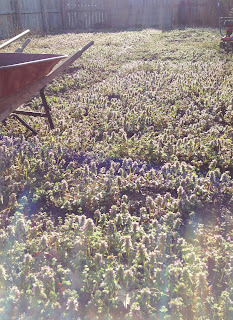 Your "deadnettle garden" reminds me of the "hairy bittercress garden" I was faced with last weekend when I planted my peas. Fortunately, the bittercress is easier to remove. Sometimes other things in our life must take priority and the weeds get ahead of us. I know, it's happened to me many times. You know what they say, "If you want to get something done, ask a busy person to do it." I'm glad you found someone to help you with that deadnettle. There are only so many hours in a day. Thanks for the reminder to plant the peas. I tend to forget in the madness that is the St. Patrick's Day Irish Dance troupe season. 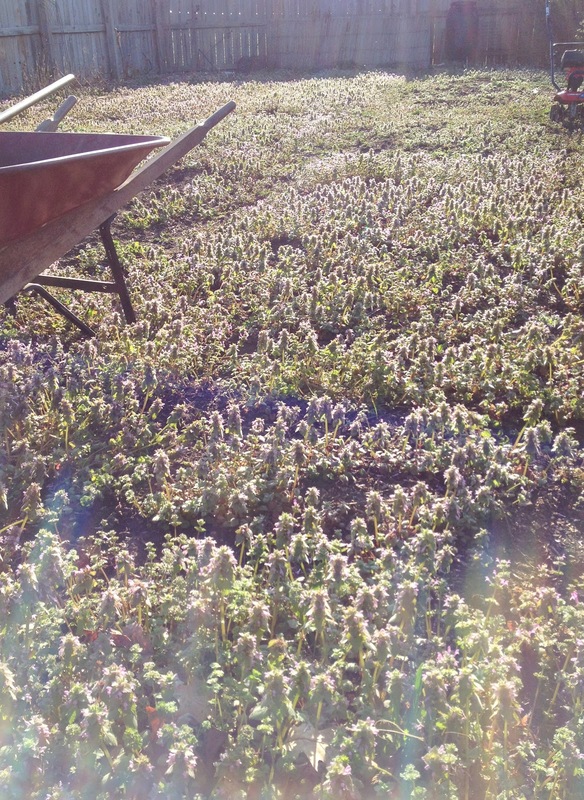 Good luck with that Lamium. I'm still trying to get rid of it all, after 3 years. Wonderful to get in the garden again. I am a bit farther south than you (Mississippi), so I planted my early peas at the beginning of March. My first time to grow peas - bought ones called Alaska developed for a short growing season. I'm hoping they will mature before the brutal heat of summer kills them. Just found your blog and am enjoying it very much. You feel the same about deadnettle as I do... just ripped far too much out of my little garden bed.